I liked the discussion that followed and decided to give this business method a closer look. 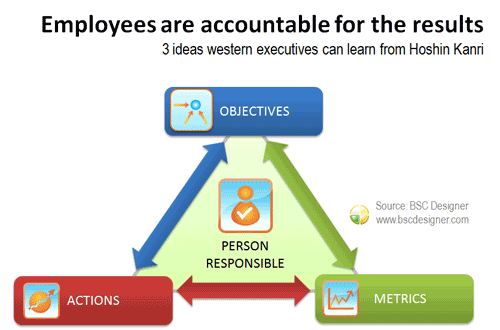 It is not a mainsteam, it is not as popular as other “lean” tools, and it is not so promoted in the form of workshops/certifications/books as is the Balanced Scorecard, but I think some of its ideas can be employed by any western executives. Japanese words “Hoshin” and “Kanri” literally mean “a method for strategic direction setting” and “management/control.” It was popularized in Japan in the 1950s by Professor Yoji Akao (the website of his colleague Karen Roberts is one of the starting points to learn about the Hoshin Kanri method). It was widely used by Toyota and claimed by many business authors to be a reason for Toyota’s success. In the Western world a significant role in the fame of the Hoshin Kanri was played by Hewlett Packard. One thing before we start: there is no 100% agreement on elements and the processes of Hoshin Kanri; many schools and practitioners teach it in a different way. Needless to say we see the same uncertainty with other business concepts. I’m sharing a personal point of view on Hoshin Kanri (which might be affected by my background with business and balanced scorecards) based on what I have learned and what I saw while working with some of our clients who employed this method. When reading books and articles about Hoshin Kanri I often had a feeling that I had heard this before. The reason is that many authors are trying to pack Hoshin Kanri’s ideas into a new shiny box just arrived from Japan and claim that this method contains unlimited business wisdom. Some authors overuse terms and dedicate whole chapters to the review of the terminology and finding sound analogies between Japanese and Western business management schools. Let’s try to understand what Hoshin Kanri is all about without talking too much about obvious ideas. 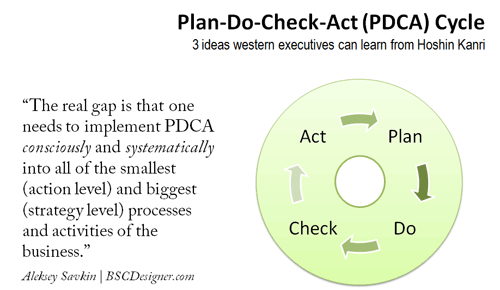 PDCA cycle stands for Plan-Do-Check-Act. It is everywhere in Hoshin Kanri, one supposed to pass this cycle onto any business iteration. I believe the real gap here is that one needs to implementit consciously and systematically into all of the smallest (action level) and biggest (strategy level) processes and activities of the business. For example: you write an article, and instead of just relying on intuition, you plan a/b test and get back with the results that prove what title works better for your audience. You planned to increase your website traffic by 40% this year, but search engines had their own opinion about promotion methods that were used. After checking the results your company might reconsider its web strategy. I’m simplifying things, but that’s where the difference is. No one will argue that Europeans can learn important lessons from Japanese PDCA cycle (also known as a key part of Kaizen). Some sources imply that Japanese companies (particularly Toyota) spend a significant time on the “Plan” part of PDCA cycle, paying much more attention to planning important things before actually releasing the plan. In Hoshin Kanri terminology they call it “catchball.” In simple words, it’s the process of strategy discussion and alignment. Why invent a new term then? To underline the discussion nature of the process. It is about alignment. The ultimate goal of “catchball” process is not to define a perfect set of objectives, but to find the way how these objectives can be measured, and what’s more important, how they can be aligned with specific actions. As it was mentioned, participants of the Catchball need to agree on the processes and output measures. 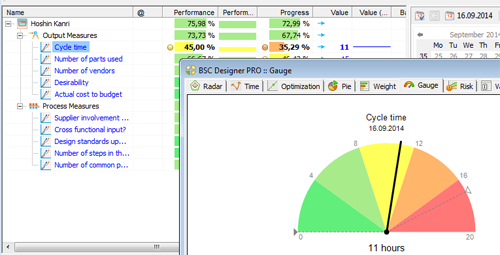 Using performance indicators is not anything new. 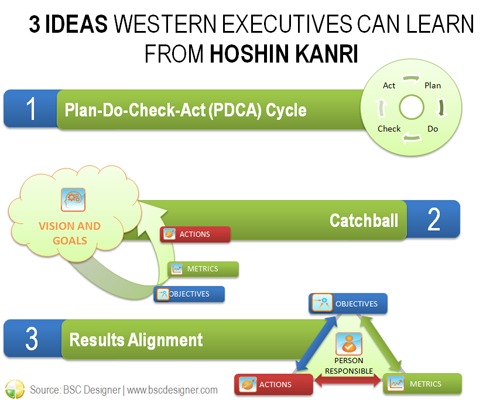 The thing is that the alignment between business objectives and indicators, as well as assigning a person responsible, is implemented in Hoshin Kanri’s DNA, as well as the PDCA cycle is. While the Balanced Scorecard is so popular these days, we need to compare it to Hoshin Kanri, as we did before with 7-S and MBO. Giving a learning and growth directions in the end. On the one hand, in some articles Hoshin Kanri elements were compared with BSC’s perspectives, and there were some similarities. On the other hand, Hoshin Kanri has no explicitly defined perspectives, it is more process oriented (see the paragraph below). One can use the classic four perspectives from BSC, or perform his own cause-and-effect analysis putting some non-financial goals on the top. Hronec (1993) in the example of the Hoshin process puts on the top level “Maintaining customer loyalty through rapid product introduction” goal. It is obvious that this goal is directly linked to some financial goals, so if needed it can be explained in BSC’s paradigm as well. From the first look at the keystone of the BSC are strategies together with high-level business goals, while Hoshin Kanri is more focused on the processes and key activities. Some practitioners from BSC camp highlight this as a main difference that doesn’t allow Hoshin Kanri to be “strategic” enough. The thing is that BSC cannot be just about high-sounding strategies. In the end it needs to be cascaded to the departments, where specific low-level processes and measures will be aligned with the business objective. Sometimes these processes are told to be out of the BSC framework, but this doesn’t change the situation. In the contrast, in the Hoshin Kanri approach we start talking about processes on the early stage, which makes this concept to look more practice-oriented and easier to understand/implement. High-level strategies might not be explicitly defined in Hoshin Kanri, but they are for sure implied. In Hoshin Kanri the learning component is formulated more explicitly. The heart of the concept is the PDCA cycle and it is everywhere. This provides a natural, never-ending education circuit, which supports finding some unexpected ideas, problems, and new solutions. In BSC objectives from “Learning and Growth” perspective support objectives from higher levels. The rest depends on particular implementation. Some companies are serious about learning and implement some continuous improvement methods similar to the PDCA cycle. Another keeps the Learning and Growth perspective very formal. I wouldn’t call it a disadvantage of BSC, but sometimes it is “too strategic” and forces its users to look for more business tools to solve their day-to-day problems. As BSC, Hoshin Kanri suggests to use a standardized set of the reports. As it often happens companies rarely follow these specific forms, following the ideas implied by these reports instead. Regular review of the performance against previously defined goals are normally done, but the form of these reviews and reports might be different. As it was shown above, the difference between the Balanced Scorecard and Hoshin Kanri is more conceptual. While both methods have their own unique features, from the view point of automation the picture looks very similar. It’s good news for users of BSC Designer that want to try Hoshin Kanri. Here is a short “translation” from the Balanced Scorecard mindset to the one for Hoshin Kanri. On the “Business Goals” tab one can describe the hierarchy of business objectives starting with strategies, vague business goals, and moving to the more detailed processes and key activities. 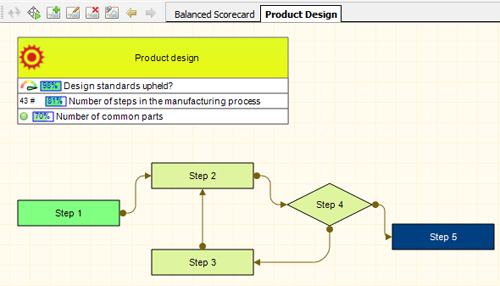 Any process or activity that needs additional explication can be visualized on the “Strategy Map” tab in a form of a process map or something similar. Also, it is a good place to visualize a Plan-Do-Check-Act cycle, especially if it is specific for this process. 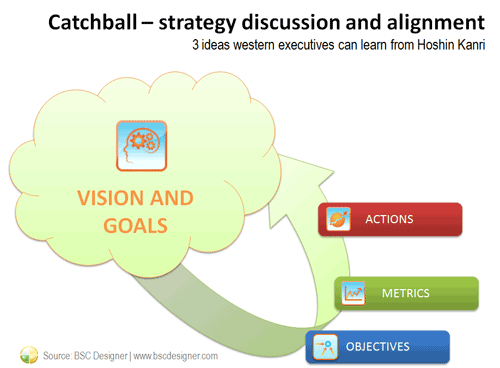 The strategy discussion process (the Catchball) is normally supported by some standard business discussion tools (might be some brainstorming tool, simple Skype call or conference room meeting), however the key results and specific plans can be formalized in the form of “Initiatives” in BSC Designer. Finally, process and output measures that are an important part of Hoshin Kanri can be formalized on the “KPIs” tab. Moreover, it is easy to link these measures visually with business goals, and processes, even when they are visualized on the strategy map. 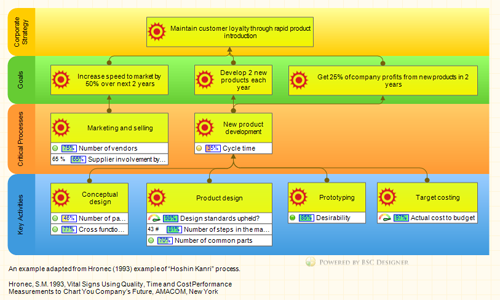 Here is an example of how Hoshin Kanri process might look like in BSC Designer. It is adapted from Hronec (1993) example of “Hoshin Kanri” process mentioned above. Hoshin Kanri Example online - sign-up with a free account for immediate access to 16 scorecard templates. Honda’s intervention in Western market of motorcycles was always given as an example of an excellent strategy planning (one of the explanation was given by BCG, Boston Consulting Group). Richard Pascale, co-author of The Art of Japanese Management (1981) did his own research. According to the interviews that he did with those managers who were the first to arrive in the US, the story looked a little bit different. Having a short budget, and limited governmental support, four managers of Honda had to rent a cheap apartment in Los Angeles, two of them were sleeping on the floor. In the beginning their major promotion method was just to drive around to attract attention… According to their own words they had no specific strategy at all, just an idea about trying to sell in the US. Implement a Plan-Do-Check-Act cycle more systematically, not just when the business gets into a problem. Discuss strategy, goals, objectives, measures and actions, rather than just translate them top-to-bottom. Systematically integrate learning into all business iterations, not just in the formal business training. What do you think about Hoshin Kanri? Let’s discuss it in the comments.